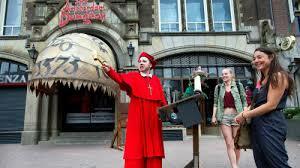 Amsterdam Dungeon is an interactive experience telling the dark history of Amsterdam through horror theater. As you walk through the dungeon you witness short performances by actors which include tales of medievil torture, the plague, Rembrandt workshop with human corpse vivisection and witch trials. All of this is accompanied by flashing lights, smells, sounds and for most of your journey you are in the dark. 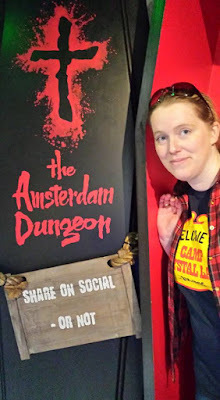 The Dungeon was one of the highlights of my trip to Amsterdam. From the very start you experience what it must have been like for slaves and prisoners hundreds of years ago as you are packed into a small dark cell with other visitors while you wait your turn for the tour. My advice though is to make sure you have a drink with you for your wait as it can get quite warm in the cell. Part of the excitement on the tour is being in the dark. You don't know what to expect. Lights can go off and when they turn on again one of the actors is right in your face giving you the ultimate jump scare. The actors where amazing and their interaction with the crowd was hilarious. My favourite incident was in the torture room as one of the male visitors was put in the torture chair and the actresses interaction with him had everyone laughing out loud. The special effects throughout the tour were fantastic and when you enter the maze of mirrors you get completely disorientated and have to find your way out. A massive thank you to Chiel for my press tour of the Dungeon.